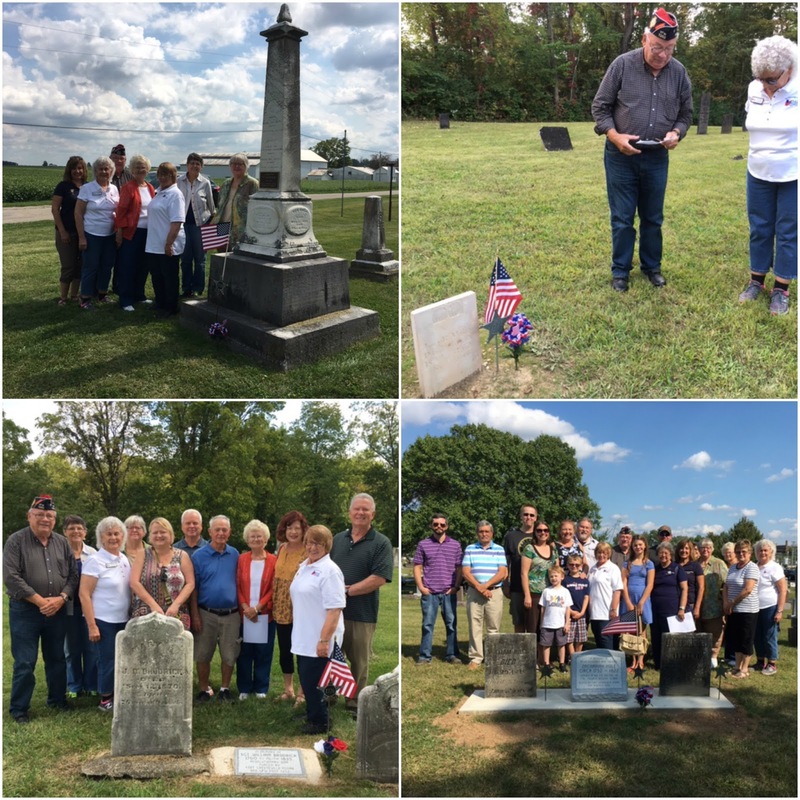 Fort GreeneVille Chapter DAR dedicated four American Revolutionary War graves on Sept 16. Three grave markers were dedicated in the New Madison, Ohio area and one in Versailles, Ohio. William Brodrick in Old Friendship Cemetery was in the New Jersey Milita with ranks of Sergeant and Private. He was at Valley Forge and marched across the Delaware above Trenton, New Jersey, Battle of Monmouth. Peter Rush in First Universal Cemetery was in the Bedford County Pennsylvania Militia with the rank of Private. Joseph Wiley in Providence Cemetery was in the Virginia Militia with a rank of Private. He served mostly in the Carolinas. Zachariah Hole in Black Swamp/Greenlawn Cemetery was in the Virginia Militia and served under Col. George Rogers Clark. Also attending the dedications were descendants for Brodrick, Rush and Hole. Descendants ranged from 5th to 7th great grandchildren/uncle lineage. VFW Post 7262 representative Don Dietrich was also present due to the VFW's generous donation for purchasing markers. Fort GreeneVille Chapter would like to thank all those who have helped in this endeavor especially the township and cemetery trustees. The project is still ongoing with several more dedications being planned. Top Left: Peter Rush in First Universal Cemetery: Debbie Nisonger, Helen Wright, Don Dietrich, Caroline Petitjean, Shirley Hughes Mary Jane Dietrich and Brenda Arnett. Top Right: Joseph Wiley in Providence Cemetery: VFW Post 7262 Don Dietrich and DAR Helen Wright. Bottom Left: William Brodrick in Old Friendship Cemetery: Don and Mary Jane Dietrich, Helen Wright Brenda Arnett, Debra and Eric Augustine, Neil Augustine, Caroline Petitjean, Stephanie and Frank Saymanski and Shirley Hughes. Bottom Right: Zachariah Hole in Black Swamp/Greenlawn Cemetery: Tom and Daniel Hole, Jason/Jodie/Joel/Jonas Robinson, Mary and Larry Shmaker, Shirley Hughes, Don Dietrich, Sophia and Doris Aultman, Cemetery Superintendent Brian Gehret, Debbie Nisonger, Mary Jane Dietrich, Brenda Arnett, Caroline Petitjean, Cemetery Trustee Betty Armstrong and Helen Wright.